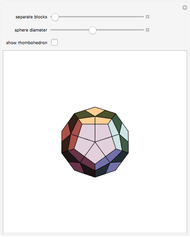 Twenty blocks are used to assemble a dodecahedron. The relationship of the blocks to the golden rhombohedron is also shown. 1. 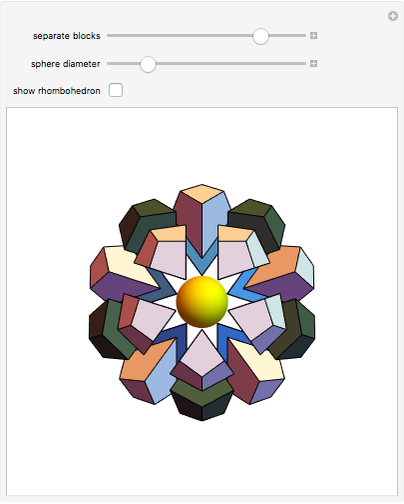 The block fits into a golden rhombohedron. 2. The angle between the edge of the rhombohedron and the dodecahedron surface is 90 degrees. 3. The rhombohedron is to be cut three times. If the rhombohedron is placed on a flat surface, then make the cut at an angle of relative to the horizontal direction starting from a vertex. Sándor Kabai "Dodecahedron Made of 20 Blocks"